Aren’t these little gingerbread men cute?!! They’re a brand new limited edition seasonal product made by MI-DEL. I used MI-DEL classic Ginger Snap cookies to make a crust for pumpkin pie and decorated it with the Limited Edition Gluten-Free Gingerbread Men cookies. Then I arranged for some very finicky taste testers to give me their feedback on it. The official taste testers were my little friends Chloe and Noah….and…. ….Lila. And they all can eat whatever they want. They don’t have any food allergies or restrictions. These guys are serious professionals. Here’s a better view of the crust. Now, you know I’m all about easy when it comes to cooking, and this recipe was, well…easy as pie! (Sorry, couldn’t resist!) In fact, it’s soooo easy you could include your favorite little people in the process. And why spend your time rolling out pie crust when you can easily press a crushed cookie mixture into a pie pan and then go and enjoy the rest of your day? I know some people find rolling out pie crust to be therapeutic in some way, and I’m happy for them, but I’d rather be outside soaking up this last bit of gorgeous Fall weather. OK, Soooooo here’s the extra fun part! I have six coupons for FREE MI-DEL products!!!! And they’re pretty easy to find in stores. I’ve seen them in my local Stop N Shop grocery store in the natural foods aisle. If you aren’t sure where to find them in your area, there’s a nifty store locator on their website. If the new Limited Edition Gluten-Free Gingerbread Men haven’t hit your store shelves yet, you can order them online here. So, just post a comment below and I’ll pick the six winners and post them on Monday, October 24th. Entries must be posted by midnight Sunday, October 23rd. Need comment ideas? Anything you want to post is acceptable….but, hmm…why not tell us what your favorite pie is? Oh and speaking of different types of pies…the different types of gluten-free MI-DEL cookies can be used to make different pie crusts. You can check’em out here. 2. Pulse cookies in food processor until it forms fine crumbs. (Alternatively, place cookies in plastic bag and crush with rolling pin or mallet). Makes 1 1/2 cups crumbs. Toss cookie crumbs with melted coconut oil. 3. Press mixture into bottom and up the sides of 9-inch pie plate. Bake until light golden, about 7 minutes. Cool completely before filling. Note: For an extra-firm crust chill cooled pie for at least 1 hour or up to 24 hours. 2. In large bowl, whisk together coconut milk, honey, and eggs. In separate bowl, whisk together pumpkin, flour, spices, and salt. Whisk pumpkin mixture into wet mixture until smooth. Pour filling into crust. Bake 45 to 55 minutes, or until firm. Cool completely before slicing. *This post was sponsored by Mi-del. 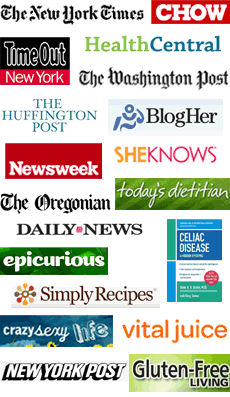 « Q&A: Celiac Disease Awareness Month Is…? I’ve made GF pie crusts with Mi-Del cookies before and it really did work well! Also, my all-time fave is pecan pie. I never thought of using Mi-Del cookies as a pie crust. What a great idea ! I have experimented using GF oreo’s (can’t recall the brand, but found them at Whole Foods), as well as GF graham crackers with nuts. Both pie treats I made turned out delicious with people wanting more…haha! I am excited to check out the Mi-Del cookies as a crust. They are yummy on their own! My favorite pie to eat is pumpkin pie, so I am really excited to try your recipe out….have used pre-made pie crusts when making them in the past (not so good). This would be a totally great way to show my celiac son “the true ways of the pumpkin pie.” (hehehe) He thinks he won’t like pumpkin pie only because he has never had one. I believe this cookie crust will be what helps him come to the other side! We found out this summer that two of my sweet daughters have Celiac so we are still struggling with figuring out how to make all their favorites in a way that’s safe for them. I’m so thankful their are blogs like yours that make this transition SO much easier! Oh and the favorite pie in our house is… pumpkin! Cherry is a close second but pumpkin wins hands-down every time! My favorite is chocolate cream pie in a cookie crust. Thanks for the pumpkin pie receipe. Your pumpkin pie with the Gingerbread Men is absolutely ADORABLE! I have been one of the dough rollers in the past, but I am definitely going to give the cookie crust a try very soon. My favorite pie is pumpkin and I just bought 2 pumpkins to roast so that I can make my thanksgiving pies. Thanks for the great idea and yummy sounding recipe! Thanks SO much! Pumpkin is my fave, but I loved the reader comment that mentioned other types of pies made with other types of cookies. I am ready to try them all out!!! This site is just super, and helps me stay on my regimen — very grateful. I enjoy the mi-del cookies but never thought to use them to make a pie. I will try it out and look for the adorable ginger bread men cookies as well. My son , who is not gf, loves the mi-del ginger bread cookies as well. My favorite pie is a tie btwn. homemade apple (deep dish of course) and pecan pie. That pie is too cute! That pie looks delicious and so fun, I know my kiddos would love those gingerbread men. Looking forward to trying this recipe soon. I’m thrilled that Mi-Del is introducing gluten-free Gingerbread Men. I’d love to win the coupons and give them a try. I love this time of year because I love to make gluten and dairy free pumpkin pie with tofu. I can’t wait to try this recipe this year! I bought a package of GF pie crust mix, in preparation for Thanksgiving. I am going to donate it to our local food shelf and use this recipe instead, as it looks so so so much easier! My favorite pie: deep dish apple, but that may change after I make this pumpkin pie recipe! My favorite pie is Chocolate Caramel Pecan Pie with a pecan meal crust. But I also love cookie crumb crusts and want to try all the different Mi-Del cookie crusts I just learned about! Looking forward to trying these cookies. Thanks for the recipe. I love pumpkin pie! I LOVE traditional apple pie and I haven’t even tried GF pie crusts because I know I’ll miss the flaky, buttery outer layer of a fruit pie. But I would definitely use these cookies for a pumpkin pie or cheesecake when I don’t want the flaky crust anyway! Thanks for the recipe! I like the mi-del gingersnaps but haven’t tried a pumpkin pie recipe yet since going gluten and dairy free. Looks delicious! And what a great idea to add the ginger bread men. 🙂 so cute! My husband already has the gf ginger cookies to make the pie! Can’t wait! He loves to bake gf and now vegan goodies for us–yum! I actually love pumpkin pie with the gingerbread cookie crust and I have Celiac Disease so these coupons would be perfect for me. Thanks. The Midel cookies also make a great crust for cheesecake,pumpkin cheesecake of course! Mi-Del is my go-to for pie crusts – and, well, to be honest, just to eat. after i was first diagnosed i bought the arrow root cookies expecting something bad (c’mon. arrow root? what is that?) but they were so good they have become one of my favorite “oh. i’m going to the kitchen, what can i grab?” cookies. i have used them recently in a key lime crust with toasted coconut and almonds. sooooooo good! Another way to go dairy free is to substitute arrowroot flour for the eggs. Oh What a great idea. I can’t wait to try out the crust recipe. I love the Mi-Del ginger snaps. I keep them in my pantry as occasional treats. I haven’t seen the gingerbread cookies but they sound – and look- delicious. Would love to try them for free. Thanks for your blog. I love all of Mi-Del’s gluten free cookies! My favorite pie is usually cherry or apple. I don’t usually like pumpkin pie pie (I know, its un-American to not like pumpkin pie), but I’m five months pregnant and right now I love anything sweet and creamy, and I’ve been craving a slice of pumpkin pie (and chocolate pie and key lime). Pumpkin pie with a ginger snap crust sounds amazing and I can’t wait to make this pie for Thanksgiving. How could I make this work if I am GF and Vegan? do you think that Ener G egg substitute would work? I love pumpkin pie, no Thanksgiving is complete without it! I use the GF Pantry Crust and this crust is much more guilt free – I may totally try this! I can’t get these in my town. My GF five year old would love this! Can you use this recipe with sweet potatoes too? Looks and sounds amazing! I have yet to find a really good basic pie crust, but this one sounds really good. I’m not sure if I can get my hands on the cookies you mention. Also, I see you are a restaurant consultant. I’d be very interested in having you guest blog about your tips and suggestions for gluten or allergy free families that want to dine out. Please let me know if you are interested. Thanks for this recipe! I needed to make a pumpkin pie for a family get together (my kids and I are recently gluten free and the only ones in the family of course). I had thought about using my MiDel gingersnaps for the crust but wasn’t sure of the amounts. I used another recipe for a no-bake filling, but this pie was great! Even if we weren’t gluten free, I would still make this. I keep an all- purpose GF flour around. My hospital co-workers think I’m weird ( well, ok) so when I get a chance to make treats it’s sorta “gotcha.” They tasted really good, and had no dairy or wheat, and were lovely. Plus, the more I learn about dark chocolate and the benefits of it, the more I want to experiment with it. My great-great grandma baked with cocoa powder and bittersweet chocolate. This awesome brownie recipe will get me through the holidays. GF. I can’t wait to make this! I’ve been looking for a pumpkin pie recipe that’s as easy as pie. Thanks again!